Marine SAT (Hair Algae Treatment). Marine SAT is a concentrated liquid bacteria that eliminates hair algae and also helps to control and eliminate other nuisance algae and cyanobacteria outbreaks. This non-toxic blend of eco-friendly bacteria outcompetes algae for the same food source - therefore eliminating it. Marine SAT is completely reef safe and benefits can typically be seen in 4 - 6 doses. 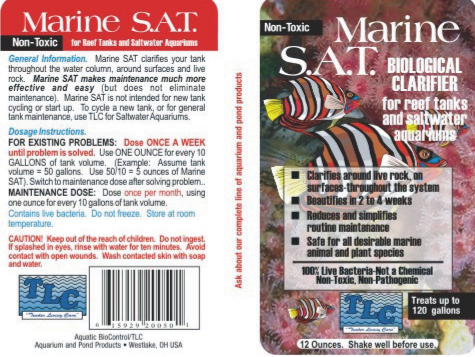 Marine SAT is our best selling product and the TLC line of additives are a customer favorite. The performance, reliability, and concentration is superior to the competition. Simply put, customers that try it . . . love it! Each bottle has a two-year shelf life and once opened, does not require the refrigerator. Available in 12 oz., 32 oz., and Gallon bottles. Each ounce treats 10 gallons weekly for a problem aquarium and once the problem is under control treats 10 gallons monthly. Optimizer - TLC Saltwater Starter/Cycle Bacteria 12 Oz.